If you are a mom or dad that loves to wear your babies – this article is for you. Babywearing is such a wonderful way to bond and soothe your baby. It is also the perfect device to get more things done when your baby wants to be held. However, babywearing can also become a pain in the back –literally. Back problems from babywearing for both parent and baby are common. Be sure to follow these tips to make babywearing safer for you and your little cutie. Carry the Weight Evenly: The weight of your baby should be disbursed evenly. This will prevent back pain on your part. Wearing your baby in a way that balanced their weight will also make them feel lighter than they are. Choose Soft Carriers Structures: Avoid baby carriers with bars or that are made of hard material, such as a hard plastic insert. These can be safe for older children, but for developing infants, it is best to use soft carriers such as a Moby wrap or Ergo carrier. Support the C-Curve: Babies should have a natural C-curve to their spines when being carried, especially up to the age of four months when their spine is still developing. Look for carriers that support this slight curve in their back, and they will be healthy and comfortable. Start Babywearing Early and Often: Imagine that you have not worked out in a year and then you attempt to weight train with 20 lbs while walking on the treadmill. You can bet that you will be feeling that workout for the next few days. The same principle applies for babywearing. You cannot expect to start carrying your 20-25lb baby for the whole day and not get back pain. To avoid back pain, you need to start babywearing when your baby is about 8-10lbs, carrying your baby an hour or two a day. Then you can build up your strength as the baby grows and gains weight. 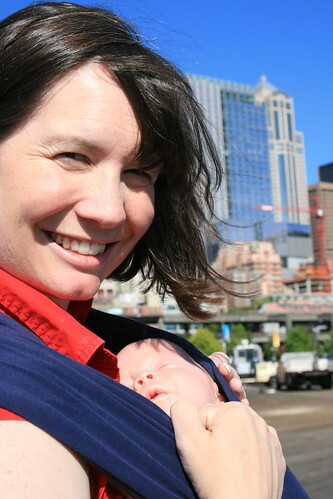 However, if your baby is heavier and older, you can still begin babywearing. Just remember to do a few simple back stretches before carrying your baby and to gradually increase the time you carry them each day. Position Baby According to their Age: To ensure your baby’s safety and development, carry them in a position suitable for their age and maturity. Babies younger than 3 months should be worn in a cradled position or a inward facing position that support their head and keeps them close to the body. Before 5 months, babies should also be worn facing in and in front of the wearer’s body. Babywearing is such a wonderful way to bond with baby. Always use your best judgment when wearing the baby and find a carrier that is comfortable for both you and your little one. Remember to always listen to your baby’s breathing to make sure it is not hesitated or strained. Me and the O by Mrs. Flinger used under the creative common license. This entry was posted in Blog and tagged Chiropractic, Women's Health. Bookmark the permalink.